The Los Angeles Police Department maintained a heavy presence on Figueroa Street during the Lakers victory parade. Each officer has a riot helmet. The heavy police presence is necessary as on June 17, when the Lakers won Game 7, fans celebrated by rioting. 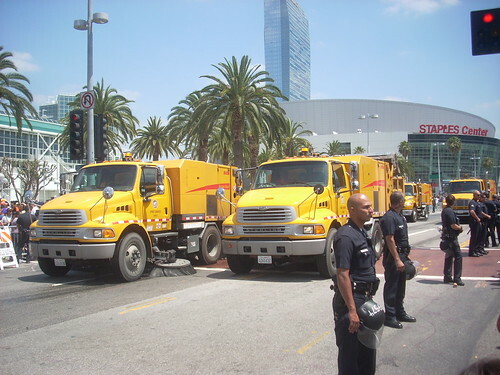 The final entrants in the victory parade are these new Elgin street sweeping vehicles (with Sterling chassis) scrubbing the trash off Figueroa Street. There was quite a lot of it to clean.